I have created this FAQ list with some of the questions I regularly receive from couples who are looking for a wedding photographer Cornwall & Devon– I hope that it might be useful with your decision making and put you at ease with the whole process! If you have a question not listed here – please get in contact and I’ll be happy help. How long have you been in business? 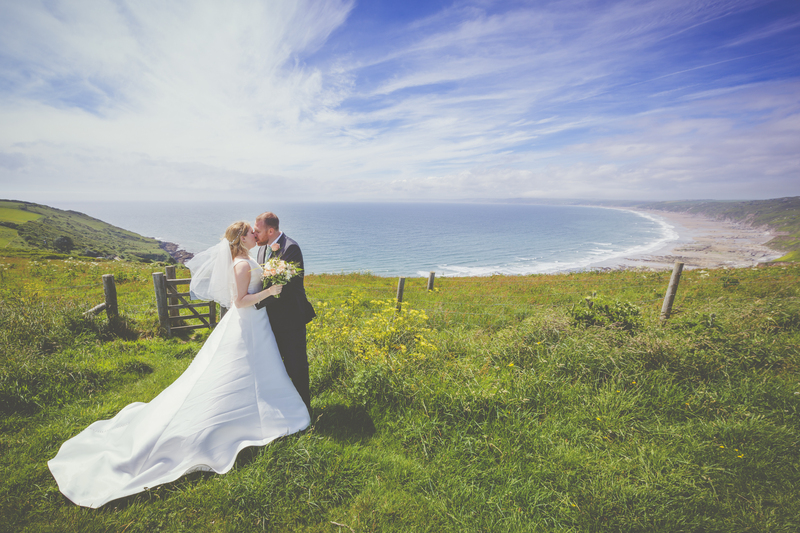 I have been providing wedding photography Cornwall & Devon professionally since 2009. How many weddings have you photographed? As a wedding photographer Cornwall & Devon, I have had the pleasure of photographing 62 weddings throughout my career, with another 18 Cornwall and Devon weddings booked for this year. What equipment do you use? I shoot digitally using professional equipment. My main camera is a Canon 5D Mark III, which I use with a large range of professional lenses and accessories. Do you shoot in colour or black & white? I shoot in colour to maintain the best quality digital originals, but you will also receive your collection of pictures in both colour and black & white. If we make a booking, will you actually be the photographer photographing our wedding? Yes, absolutely! I will personally be photographing the whole duration of your Cornwall or Devon wedding booking. I never book more than one wedding a day, and therefore my attention will be focused solely on photographing your wedding day. Do you work with an assistant? I will occasionally use an assistant to help carry or set up equipment, although I will always be the sole photographer responsible for you Wedding photography your. Do you shoot outside of the South-west? Absolutely! Although the majority of my work is based as a wedding photographer in Cornwall & Devon. I love travelling and can cover weddings anywhere in the UK and abroad. Do you have liability insurance? Yes! I have full public liability insurance – which is often an essential requirement to be allowed to work within some wedding venues. I am interested in your service, what happens next? Please get in contact here! We can either arrange a friendly consultation at a place and time that suits you. If a physical meeting isn’t possible then we can arrange a meeting over Skype. Alternatively, we can get everything arranged through a mobile or email conversation. When do we pay you? After the deposit has been paid at the time of your wedding photographer Cornwall & Devon booking, I would typically require the remaining payment one week before your wedding date. You can pay the balance earlier if that would be convenient for you. There is also an option to pay using instalments. So what is your booking process? I want to make the booking process as easy as possible! Once you have decided to make a booking, I would send you a link directing you to your online wedding photographer Cornwall & Devon contract. The contract would outline the details of your wedding photographer Cornwall & Devon booking and the service I would be providing to you. You simply sign the contract digitally and download a copy for your records. Alongside the contract, I would also require a deposit of *£250 to finalise the booking process. *Deposit amount is flexible dependent on our agreement. How far in advance do we need to book you? People often book up to a year in advance, so I advise you to get in contact as soon as possible to prevent disappointment. What information do you need from me before the wedding day? As a minimum, I would require your Cornwall or Devon wedding venue location, wedding date, and time schedule for your day. Do you do pre-wedding consultations? Yes! I am always happy to meet and talk about my service and your wedding day. I am not a salesman and there would never be any pressure to make a booking at these meetings. How will you be dressed on the day? I will dress smartly at all times – typically in suit trousers, shirt, tie, shoes, and overcoat. If your wedding has a unique dress code, I will happily dress accordingly. Do you need feeding on the day? You have enough things to organise on your day without thinking about feeding all your vendors! I normally pack myself a lunch, so there is no need to arrange a meal for me! I don’t like my photograph being taken! Rest assured that this isn’t uncommon, and I actually don’t like my photograph being taken either! I have never failed to capture a couple enjoying their wedding day. My approach is all about being discreet and capturing natural pictures throughout your day – you will barely be aware of my presence. For those moments when photographing portraits and family groups, I will ensure it’s a relaxed and a fun experience. What happens if you are ill on the day? I take my health and fitness seriously and am proud to say I have never been ill from work, or too ill to shoot a wedding. However, I am part of a network of highly experienced wedding photographers, and in the unlikely event of an illness physically prevented me moving (and therefore attending your wedding), a replacement photographer with the same level of experience would be offered. An immediate refund would also be available if you decided not to accept any of the replacement photographers offered. What happens if your camera gets a fault? There is no excuse for missing any moments through equipment faults – all of my equipment is top of the range and well maintained. I also have backup equipment for everything I need, and backup equipment for my backup equipment! What happens if it rains? This is something asked quite regularly by couples. Rest assured that if it rains it won’t affect the quality of your pictures. It might be a case of being flexible on the day and making the most of any breaks in the weather to get outside pictures. Rain can even present great opportunities to get atmospheric and romantic pictures outside under umbrellas or shelter! I am also well equipped to capture and create beautiful photographs inside in any setting. How long will it take to receive my wedding pictures? Editing every photograph individually from a wedding takes around 30 hours. Tyically, 3-6 weeks after your wedding day (demending on my work load at the time) your pictures will be delivered. I will strive to complete them as quickly as possible, and can happily give you regular updates on their progression. While you are waiting for the full collection to be delivered I can happily provide preview pictures. If you have a question that hasn’t been answered then please don’t hesitate to get in contact. You might also be interested in reading some kind words left from previous grooms and brides, which you can read here.